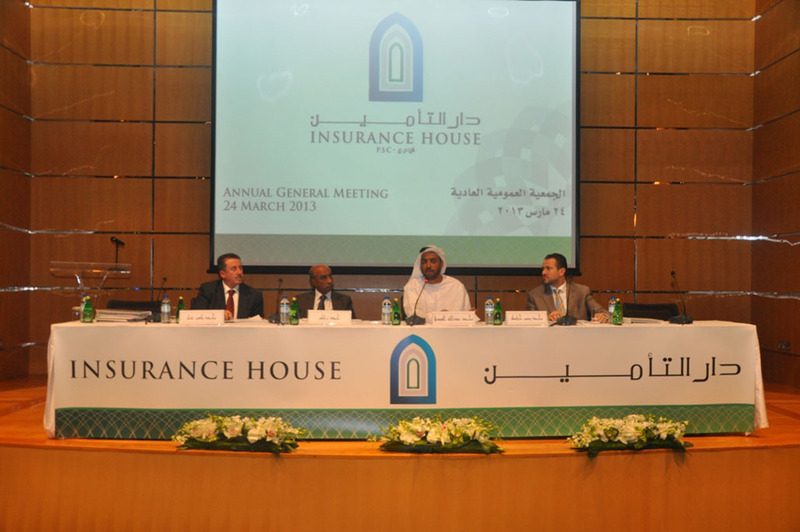 Abu Dhabi, 25 March, 2013 – Insurance House PSC (IH), has held its first Annual General Meeting and presented its remarkable annual results to its Shareholders, by exceeding the forecasted profits set for year four in the Prospectus at the time of its Initial Public Offering (IPO). A net profit of AED 7.54 million was registered for the year ended 31 December 2012, Gross Premiums Written (GPW) during this maiden reporting period totaled AED 78.4 million. Total Assets grew by a whopping 140% to AED 302.6 million as of 31 December 2012 compared to AED 125.8 million as of 11 April 2011. Bearing in mind the need to invest for accelerated growth in the near term, the Board has not recommended any cash dividend payment for the year ending 31 December 2012. However, the Board decided to initiate a Share Buyback Program for up to 10% of the Company’s shares. Necessary regulatory approvals for the Share Buy Back Program have been obtained. “We believe that there is no better investment we can make than in our own future. The share buyback initiative is in the best interests of our shareholders and the Company and is intended to enhance shareholders’ value,” Added Alqubaisi. “The recorded income from investing activities amounting to AED 23.5 Million shows that our investment strategy was well thought and clearly documented in a professionally developed Investment Policy Manual that covers asset selection criteria, asset allocation guidelines and exit strategies amongst others. There is also an in-built review mechanism for periodic fine-tuning of investment strategy in line with changes in the local and global investing environment,” continued Alqubaisi. Since inception, Insurance House has crossed several major milestones at a rapid pace- first successful post-financial crisis IPO in the UAE, operating break-even in less than 12 months from commencement of operations, impressive list of Class A clients, an attractive bouquet of tailor-made insurance solutions and rapid expansion of branch network. We have invested in the right people, processes and systems, the Chairman said, adding: “We have been able to attract to our ranks, top caliber insurance professionals with extensive experience in the UAE market. More than 14% of the Company’s current workforce comprises of UAE nationals, manifesting our strong commitment to the development of UAE nationals in the insurance sector. In recognition of our commitment and ongoing efforts to develop UAE nationals in the insurance sector, the UAE Insurance Authority presented the Company with an award in November 2012,” he added. “We look forward to 2013 with optimism and have accordingly set ambitious business growth targets. Our strategy is sound and is backed by a robust infrastructure that is geared to deliver profitable growth and maximized returns to our shareholders,” the Chairman concluded.